Let us help you find what you're looking for! 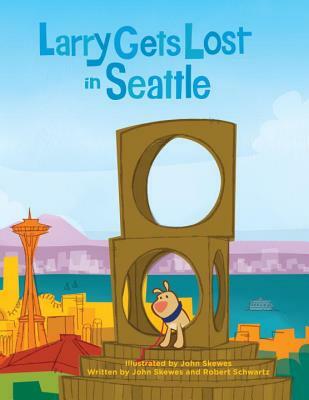 Larry Gets Lost in Seattle is an interactive, highly visual children's story about a young boy (Pete) who goes to Seattle with his family and is temporarily separated from his cute little dog, Larry, while sightseeing. In his search for Pete, Larry encounters many Seattle landmarks and cultural attractions before the two are reunited. John Skewes is a professional illustrator living in Seattle. He began work as a product designer and character artist for Disney Consumer Products before leaving to start his own company, Retrodyne Industries in 2001. His clients include Warner Bros., Hanna-Barbera, Fox, Pixar, and Simon & Schuster. As the creator and illustrator of the award-winning Larry Gets Lost(TM) children's book series, John has followed Larry from the southern tip of Texas to tiny Nome, Alaska, and been lost several times himself. He has illustrated over 20 children's books, including the Flintstones, Tom and Jerry, and Alvin and the Chipmunks. Robert Schwartz helped create the best-selling line of Wacky Wobbler toys. He lives in Edmonds, WA. What we're reading, author events and more! Liberty Bay Books started as Shotwells Bookstore in 1977, purchased by current owner Suzanne Droppert in 1996.